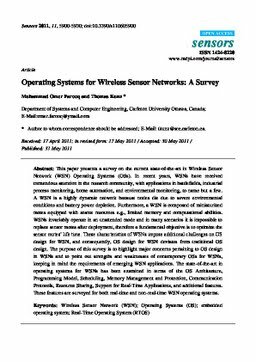 This paper presents a survey on the current state-of-the-art in Wireless Sensor Network (WSN) Operating Systems (OSs). In recent years, WSNs have received tremendous attention in the research community, with applications in battlefields, industrial process monitoring, home automation, and environmental monitoring, to name but a few. A WSN is a highly dynamic network because nodes die due to severe environmental conditions and battery power depletion. Furthermore, a WSN is composed of miniaturized motes equipped with scarce resources e.g., limited memory and computational abilities. WSNs invariably operate in an unattended mode and in many scenarios it is impossible to replace sensor motes after deployment, therefore a fundamental objective is to optimize the sensor motes' life time. These characteristics of WSNs impose additional challenges on OS design for WSN, and consequently, OS design for WSN deviates from traditional OS design. The purpose of this survey is to highlight major concerns pertaining to OS design in WSNs and to point out strengths and weaknesses of contemporary OSs for WSNs, keeping in mind the requirements of emerging WSN applications. The state-of-the-art in operating systems for WSNs has been examined in terms of the OS Architecture, Programming Model, Scheduling, Memory Management and Protection, Communication Protocols, Resource Sharing, Support for Real-Time Applications, and additional features. These features are surveyed for both real-time and non-real-time WSN operating systems.